This month, the world celebrates the 100th anniversary of the birth of Roald Dahl, beloved children’s author of family favorites like “Charlie and the Chocolate Factory,” “James and the Giant Peach,” “Matilda” and Dahl’s personal favorite, “The BFG,” as well as World Dream Day, an annual event honoring “the dreamer, visionary and innovator in all of us.” It seems a fitting time to announce the in-home release of “The BFG,” Disney’s fantasy adventure film directed by Steven Spielberg, on Dec. 6 on Digital HD, Blu-ray™, Disney Movies Anywhere, DVD and On-Demand. will brighten the holidays for the whole family! BURBANK, Calif., Sept. 23, 2016 — As dreamers around the globe gear up for Sunday’s World Dream Day, an annual holiday honoring “the dreamer, visionary and innovator in all of us,” it seems a fitting time to announce the in-home release of “The BFG,” Disney’s fantasy adventure film directed by Steven Spielberg and featuring a dream-collecting Big Friendly Giant. This heartwarming tale for the whole family arrives home for the holidays on Dec. 6 on Digital HD, Blu-ray™, Disney Movies Anywhere, DVD and On-Demand. “The BFG” unites the talents of three of the world’s greatest storytellers – Roald Dahl, Walt Disney and Steven Spielberg – to bring to life the classic tale of a courageous little girl named Sophie (newcomer Ruby Barnhill) and a gentle and charming Big Friendly Giant (Oscar®-winner Mark Rylance) who introduces her to the wonders and perils of Giant Country. 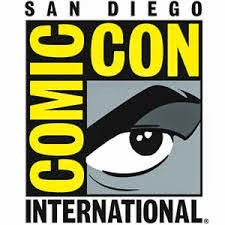 Spielberg employs a new, hybrid style of filmmaking blending live-action and performance-capture techniques, resulting in genuine, heartfelt performances and super-photorealistic animation. 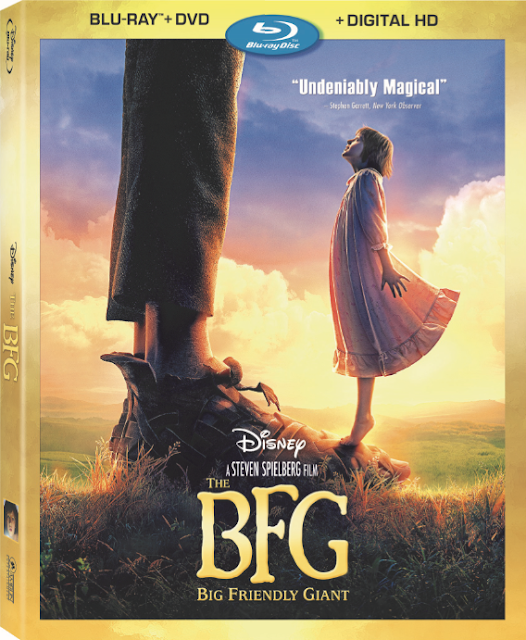 Families and fans will be swept away by this spectacular adventure and delight in extensive bonus features, including a behind-the-scenes look at the making of “The BFG” hosted by Ruby Barnhill and featuring Steven Spielberg; a charming, all-new short; a fun and whimsical tutorial on the Big Friendly Giant’s unique language of Gobblefunk; a touching tribute to screenwriter Melissa Mathison (“E.T. the Extraterrestrial,” “The Black Stallion”); and more. Spielberg’s directorial debut with The Walt Disney Studios was a labor of love, as he’s been a fan of Dahl’s for years. In fact, he read “The BFG” to his own children when they were younger. 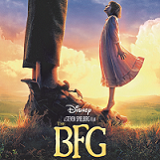 According to Spielberg, “It’s a story about friendship; it’s a story about loyalty and protecting your friends; and it’s a story that shows that even a little girl can help a big giant solve his biggest problems.” “The BFG” is a Golden Phizzwizard* come true for Spielberg, Dahl fans and audiences around the world. Bringing “The BFG” to Life – Ruby Barnhill (Sophie) hosts a phizz-whizzing journey through the making of “The BFG.” This behind-the-scenes documentary details the film’s progression through interviews with Roald Dahl’s daughter Lucy Dahl, screenwriter Melissa Mathison, executive producers Kathleen Kennedy, Frank Marshall and Kristie Macosko Krieger, and numerous members of the talented cast and crew. The Big Friendly Giant and Me – Sophie wasn’t the first “bean” in Giant Country—many illustrations were created as if drawn by a little boy who was there long before Sophie. This charming, in-world short will bring the drawings to life with animation and narration, recounting the friendship and the dreams shared between the boy and the Big Friendly Giant. Giants 101 – Jemaine Clement (Fleshlumpeater) and Bill Hader (Bloodbottler) introduce us to the loathsome giants in “The BFG,” along with movement choreographer/motion capture performer Terry Notary, who collaborated with the actors and Director Steven Spielberg prior to filming to develop their movements and character traits. John Williams: Scoring A Dream – A journey through the film’s concept art and memorable moments, interwoven with the sights and sounds of legendary composer John William’s scoring session.